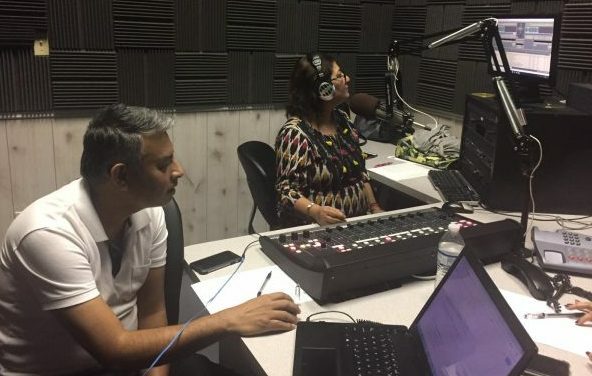 Gopa Mallick and Rajib Mukerjee have knit together a lively Bengali language radio program – Better Bangla Radio – since they started it in March 2011. HOUSTON: The Better Bangla Radio celebrated its eighth year on Saturday, March 16 with a special live on-air show. Many regular listeners shared their thoughts and views with the show’s primary hosts Gopa Mallick and Snehashis (Rajib) Mukerjee. Well-wishers from all over the world who tune in online called in over the phone to congratulate the producers during the celebration. Better Bangla Radio made its debut on March 5, 2011 as the only Bengali-language radio program in the Greater Houston area. “Our primary goal was to serve the entire Bengali community”, explained Gopa who founded the show with Rajib. Now, not only do they reach local Bengali speakers but also those in North America and worldwide through online live streaming. Rajib is a former Indian diplomat who worked in various parts of the world before coming to the US. He moved to Houston ten years ago and is a senior executive in the private sector. Gopa has been in Houston for 35 years and is at present a homemaker and community service volunteer. Over the past eight years, the Gopa-Rajib team has built Better Bangla Radio into a media which successfully conveys the rich cultural heritage of Bengal through music, songs, poem recitations, plays, talk shows, current affairs and world-news highlights. Additionally, BBR aims to expose local talent and businesses by frequently having them on the air, which is much appreciated by the Bengali-speakers from both India and Bangladesh. The program is broadcast live in the Greater Houston area every Saturday between 11 am and 12 noon on KCHN-1050 AM, online at www.betterbanglaus.com, or on a mobile device via the tune-in app. BBR archives its past programs on their website so listeners can tune in at their leisure.